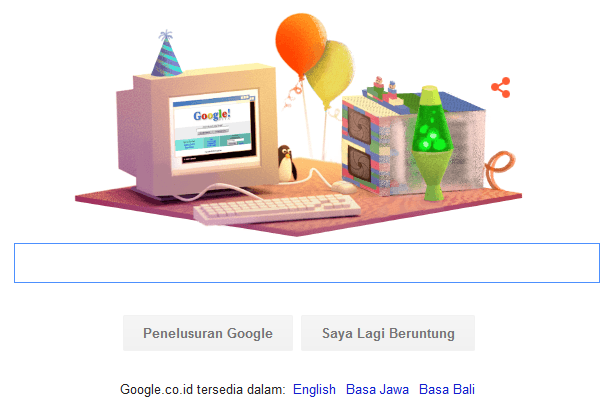 Home » Berita » English » Google » Google Birthday » Google Doodle » When is Google's Birthday » When is Google's Birthday? When is Google's birthday? This question appears on Google Doodle today, Sunday, September 27, 2015. Today is the anniversary of Google's 17th year. Do you see a logo or an animated image When is Google's birthday? On page Google.co.id or Google.com today? Yep, this is an information about Google's birthday to-17 years or sweet seventeen! Google Doodle today, When is Google's birthday? Based on information from the page Youtube page and Google Doodle, Google had a birthday that shifted over the years. But this time Google's birthday is celebrated on September 27, 2015. Google describe as the exact year of their birth depends on how you measure it. Timeline of its own, the summer of 1995 the founder of Google Larry Page and Sergey Brin at Stanford we first met. In January 1996 the founders of Google are working on a new search engine called BackRub. This search engine later renamed Google and the algorithm is then done by the name of PageRank. In 1997, the Google.com domain registered but Google has officially opened to the public and businesses in September 1998. Now from Google uses this data in 1998 to describe the years of their age or calculate their age. Still curious when is Google's birthday? Related : When is Google's Birthday?